Use the User Preferences panel to set default options for displaying data, email and messaging notifications, and buffer size. Tap the flag icon and select your preferred language from the drop-down list to override the browser language setting. Dashboard Preferences Displays options for setting the default Dashboard plot parameters (can be overridden by the plot configuration gear on the Dashboard) and the refresh rates for data and alarms. Display FFT Plot: Enable to display the FFT plot on the Dashboard. When enabled, the X-Axis-Length field is hidden. X-Axis Default Length: The length in samples of the X-axis. The default length is 50 samples. The maximum is 32,768 samples. This option is not shown when the Display FFT Plot checkbox is enabled. X-Axis Default Unit: The unit used to display data on the X-axis. Select from Samples or Relative Time. Y-Axis Default Scaling: Enable the Autoscale checkbox to automatically scale Y-axis data, or enter upper and lower range values. Data Refresh Interval: The time in mS at which channel data is updated. Channel data is updated every 100 mS by default. Alarm Refresh Interval: The time in mS at which alarm data is updated. Alarm data is updated every 1,000 mS by default. 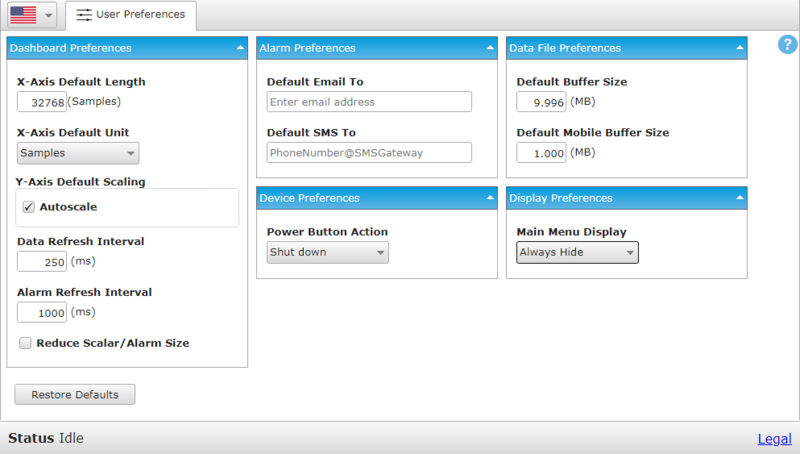 Alarm Preferences Displays the default address used to receive email and SMS messaging notifications. Default Email To: The email address used for alarm notifications via email. You can specify any valid email address here. This address will be used as a default address when setting up a new alarm with an email action. The email will send using the email server you defined in the Device tab. You can change the email action email address to a different address with the Alarms tab on the Job Editor. Default SMS To: The phone number used for alarm notifications via SMS text messaging. You can specify any valid phone number and SMS gateway here (usually in the form 'number@gatewayname.com', but varies). 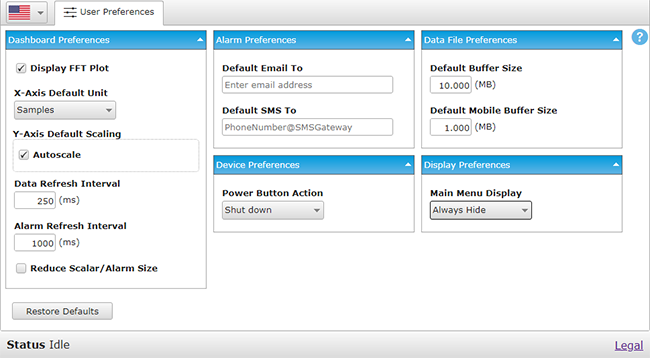 This number and SMS gateway will be used as the default when setting up a new alarm with a text message action. The text message will send using the email server you defined in the Device tab. You can change the text message action SMS number and gateway to a different one with the Alarms tab on the Job Editor. Data File Preferences Displays options for setting the default buffer size used when displaying data from a file. Separate values can be set for computers and mobile devices. When a file containing a data set larger than this value is opened from the Data Files window, a dialog is presented to select a subset of the data from the file. Default Buffer Size: Sets the maximum amount of data that will be selected for the data plot when a WebDAQ data file is opened from the Data Files window using a desktop or laptop computer. The default value for buffer size is 10 MB. Default Mobile Buffer Size: Sets the maximum amount of data that will be selected for the data plot when a WebDAQ data file is opened from the Data Files window using a mobile device. The default value for mobile buffer size is 1 MB. Device Preferences Power Button Action*: Sets the default behavior of the WebDAQ when the POWER button on the device rear panel is pushed. Note: This feature was added after Firmware version 1.1.8. Update older devices for the best user experience. Shutdown: Configures the WebDAQ to shut down when the POWER button on the device rear panel is pushed. This is the recommended setting when jumper W1 is installed. Restart: Configures the WebDAQ to restart when the POWER button on the device rear panel is pushed. This is the recommended setting when jumper W1 is removed. When Restart is selected, the Shutdown button is disabled on the Device panel. * Feature added after Firmware version 1.1.8. Update older devices for the best user experience. Remove jumper W1 to continuously supply power to the WebDAQ whenever the power adapter is plugged in and receiving power. When jumper W1 is removed, the only way to shut down the WebDAQ is to unplug the power adapter. Refer to the Power-On Mode topic for more information. Restore Defaults Resets all preferences to factory default values. A confirmation dialog displays to accept or cancel this action.